The port of Oranjestad, currently the main commercial harbor of Aruba, is situated on the south-western end of the island. The port is open for day and night navigation, allowing vessels to enter and leave at any hour. It is located along the waters edge of the capital, Oranjestad, which makes a colorful sight upon entering of the harbor. The ships moor within walking distance from the shopping centers, a 10 minute drive from the beaches, and a little over 2 miles from the international airport. The port of Oranjestad also serves all containerized cargo handling operations until its scheduled move to Barcadera in mid 2015. This adjacent cargo facility is equiped with a 50 ton gantry crane with a loading rate of 20-30 moves per hour and 250 meters of quay length. This facility is used primarily for processing the imports for local consumption and the remaining represents Free-Zone type and transshipment cargo. The harbor has a depth of 33 feet at MLW. The safe salt water draft approved for entering and leaving is 30 feet 00 inches. 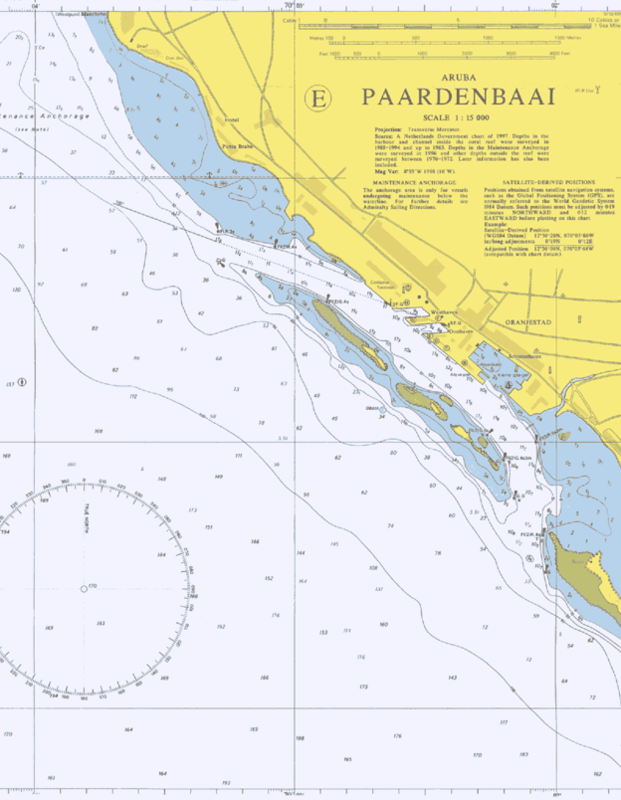 Vessels normally enter via the Western Channel and depart via the Eastern Channel. In total, there are 4070 feet of dock length available to accommodate ocean going vessels. The Port of Oranjestad has five cruise berths: Two berths with two Cruise Terminals measure 1910 feet in length and the other two berths sharing one Cruise Terminal are 1443 feet in length. One additional Cruise berth has 557 feet of length. Water depth ranges from 32 to 36 feet. On weekends the container berth is used as a third mega cruise berth. The Cargo Terminal has a total area of 1.4 million sq. feet; 7500+ TEU’s storage capacity and 36 Reefer points. The Port has one Ship-shore container gantry crane: Nelcon 50t, that can move 20-25 boxes per hour. CFS in Port total area over 53,800 sq. feet. Total Container Terminal Area: 130,000m²; storage 7,500TEU; 36 electric reefer points. Cruise Berths: 2 permanent Mega berths with Cruise Terminal each, 2 medium size berths sharing Container quay is used when a 3rd mega cruise berth is needed.